Happy 140th birthday, Santa Rosa High School! Or maybe it’s really the 137th, as the high school was discontinued between 1880-1882, but hey, when you’ve got that many candles on the cake, it’s okay to be a little fuzzy on the particulars. The current high school is the town’s third; the original was the Fourth street public school that taught children of all grades (it was at the current location of Fremont Park to Brookwood Avenue). When that became too crowded in 1895 they built a school just for high school students on Humboldt street, the same location as today’s Santa Rosa Charter School for the Arts. It took Santa Rosa only fifteen years to outgrow that place. 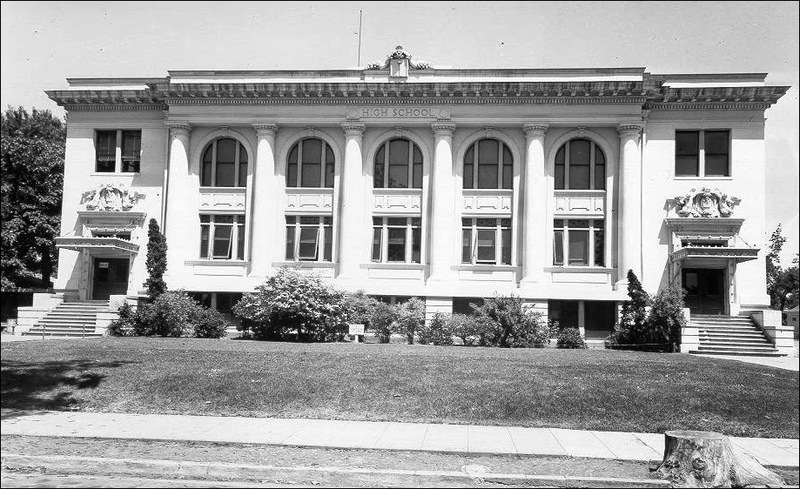 There was nothing wrong with the Humboldt street high school – it rode out the 1906 earthquake with no reported damage – but it was just too small. 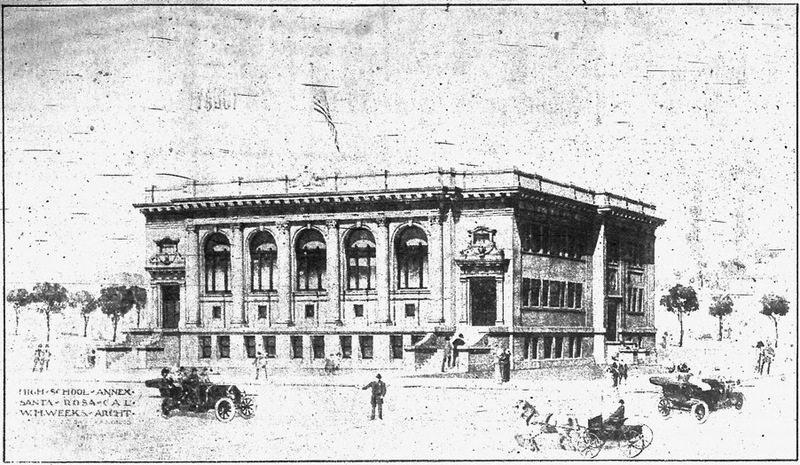 Plover was speaking at a 1911 alumni meeting seeking to drum up support for a municipal bond to buy the land next door to the south and build an annex. Mention “school annex” today and it probably calls to mind temporary buildings, trailers, and similar cheap-but-quick solutions. What Santa Rosa wanted to build was a state-of-the-art education center that would serve all schools in local districts for decades. It would have a gymnasium/auditorium that could seat 1,000, a stage, shower rooms for both boys and girls, even classrooms dedicated to teaching typewriting and “household sciences.” A large playground with a quarter-mile track would lend a campus atmosphere to the grounds. The drawback: All this would cost the eye-popping sum of $80,000, about one-fifth of what was spent on the sprawling and palatial county courthouse a few years earlier. That was a LOT of money to ask voters to approve for a mere annex to an existing school. Amazingly, the bond measure passed with apparently no squawk. By contrast, the 1923 bond to build our current high school faced a citizen’s lawsuit that threw the town into uproar, and that was to pay for a new school which was urgently needed because the Humboldt street high school had burned down – more about that in a following article. The Annex remained part of the high school even after the new building was opened at the present location. In 1942 it was christened the Santa Rosa Junior High School, which it remained until it was demolished c. 1970. A neighbor who still lives across the street watched bemused as crews of workmen struggled to tear it down; it was so well built, he says, the demolition contractor lost a bundle on the project. Should the city ever decide “progress” demands we get rid of the current high school – still going strong despite 90 years of continuous use – bring a sturdy lawn chair and a mountain of popcorn. It’s gonna be a loooong show. The new structure is to face west…and will have a basement and two stories. The exterior will be rather plain but the interior will be fittingly for the various purposes for which it is intended. The basement will have girls’ dressing and sanitary rooms with showers and all other conveniences on the north front and the duplicate for boys on the south front. On the east will be the household science department with dining room, pantry, lockers, sewing room, fitting room, drying room, janitor’s quarters, lumber and storerooms, heaters, motor for circulation, teachers’ room, lockers, etc. There will also be three commodious class rooms on the first floor with an apparatus room, girls’ and boys’ cloak rooms, corridors, and a suitable stage with all modern conveniences for presenting dramatic plays, etc. In addition to the balconies on the second floor for the auditorium or gymnasium there will be four class rooms, teacher’s room and typing room, in addition to corridors, cloak rooms, and necessary closets, etc. The exterior of the building will be of concrete plaster with terra cotta cornice and trimmings for doors and windows. There will be a double entrance in front–one on each end of the building–while other entrances are provided for the north and south sides of the structure.